“Cars now are very agile and nippy. Big lorries have got better but they’re still nowhere near as manoeuvrable as cars,” Laurie said. “Drivers of smaller vehicles nip alongside lorries at roundabouts and around bends without realising that the HGV driver doesn’t have eyes in the back of their head. Although the HGV driver might check their mirrors regularly, cars can be alongside in their blind spot in the blink of an eye.” The message is clear: if the car doesn’t give the lorry as much room as it needs, there will be a coming together. How much can an HGV driver see? “The biggest hazard for car drivers is being side-swiped by a lorry,” claimed Laurie. 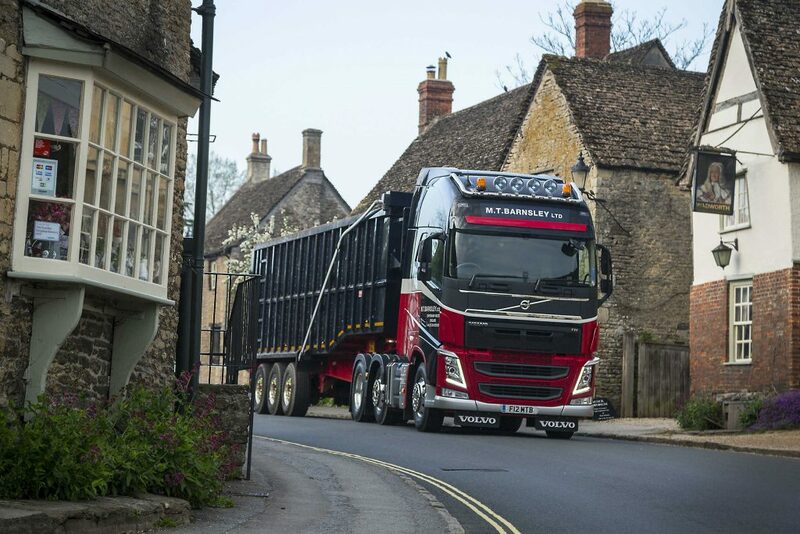 “HGV drivers have huge blind spots, particularly when they’re turning corners. As soon as they start turning to the right, perhaps on a roundabout, HGV drivers struggle to see down the left-hand side. And if they’re turning left, they have the same problem on the other side. How much of a hazard are foreign trucks? “Car drivers really must be aware that when they pass left-hand drive foreign trucks on the right, as you would on a motorway or dual carriageway, the driver might not see them. How much can lorry drivers see when making tight turns? What about running into the back of HGVs? Statistics from the Department for Transport show that in 2015, 282 people were killed in crashes involving HGVs in the UK. On motorways, 45 people died in HGV crashes. Just fewer than twice as many ‑ 81 people – were killed in cars. However, cars covered six and a half times more miles on motorways than HGVs. The most recent data for left-hand drive truck crashes is from 2009. It shows that 7 per cent of deaths in accidents with HGVs involved foreign-registered trucks. Having regularly driven 7 1/2 tonne lorries, I know that many car and van drivers do not appreciate the problems all lorry drivers have when there are smaller vehicles close to them. It is not just being in a blind spot; drivers of smaller vehicles will nip around large ones just to get ahead. And I have seen plenty of times when a lorry will drift onto the hard shoulder, or across lanes. Another fault with HGV drivers – often of the same company – is very close tailgating, presumably to save on fuel consumption by slipstreaming the lorry in front. “Just-in-time” schedules do not make better drivers. Most likely places to encounter lots of HGVs at one time are on motorways. Many car drivers are not up to motorway driving, if they do not use M-ways that much, nor are their cars. It is easy to accelerate beyond one’s normal speed but not so easy to get out of a bad situation. As an older driver I voluntarily gave up M-way driving some years ago as I knew my reactions were not fast enough to deal with sudden changes in the road-scape. I don’t have any magic answer to that problem but I urge all drivers to be careful and not be distracted by eating, chattering, ‘phone use (even hands free) and so on. No-one knows what will happen ahead in just a few seconds. Very interesting and educational. and informs you of the problems facing lorry drivers . Most motorists , including me were or are not fully aware of the problem with blind spots. Why do they pullout on dual carriageways without looking? They should check their mirrors before they pull out. Also there should be no passing by lorries on any roads that are less than 3 or more lanes!!!! Why do they have to tailgate other lorries? I thought they had to stay 150 metres behind the vehicle in front. ” Why do they have to tailgate other lorries? ” Suppsedly to save fuel by slipstreaming. Or maybe so that only the driver in front has to think! Maybe LH Drive lorries should not be allowed on UK motorways and vice versa? Not finañcially feasible for owners to have two types of vehicles for home and abroad use. Is it not possible to fit a camera to the back of large lorries to enable the driver to read the situation on a screen in the cab? If you’re behind a lorry its your responsibility to not get too close, the lorry driver has enough to do looking where he’s going without having to worry about who driving behind him! Yes, but anything that means the LGV driver has to take their eyes of the road in front is a bad thing. These days an increasing amount of ‘technology’ means the driver has to do just that. This is not good! Any tip regarding other types of vehicles could save lives. A dead person cannot say “Well I was in the right” if it happens. Nice article Laurie. But PLEASE stop using the term “inside” lane when describing road position. Lane 1, lane 2 etc is better. Lots of novices refer to lane 1 as the “inside”lane of a dual carriage way and the lane closest to the island as the “inside” lane on a roundabout. Confused? Let’s keep it unambiguous. Why can’t everyone just take more care, leave more space and think about other drivers. OK so that would be the ideal and I suppose it won’t happen unfortunately! You mean the magic word called “patience”? Sadly not available on the UK roads. Everybody want’s to leave later and be somewhere before somebody else. I agree with John Alce – lorry drivers should not overtake on 2-lane roads. I see a lot of near misses when cars and other vehicles have to brake as one lorry overtakes another and then they drive at the same speed, side by side for some time. 2) as HGVs are mechanically limited to 56 mph, they need all the momentum they can get to keep their weight going. The problem of tailgating is one consequence of this and has been well highlighted in this blog. It is a terrifying habit. Nevertheless, if you are driving a car blithely along a dual carriageway at a steady 50 mph, please, please, please, do not cruise relentlessly at that speed in lane 2 if lane 1 is clear, believing you have a right to hog lane 2 because only HGVs belong in lane 1. You should do as spelt out in the Highway Code and move across to your default position in lane 1. Otherwise, you will simply be causing an obstruction for all the other traffic which might want to go a bit faster than 50 mph. A laden HGV will want to keep going at his maximum speed so he has a better chance of getting up the next gradient without running out of puff. Stay considerate and stay safe y’all. Brilliant comment Pat. Very self controlled too. That sort of lane hogging is literally insane. On Mways when behind a lorry I check if I can overtake without riding alongside and keep the front wheel in the corner of my eye and be ready to blow the horn if it turns my way. What is frightening about those replying to the video of the car coming up on the left side of the artic – with both turning left – is the large number blaming the lorry driver. If any of these people read the Highway Code they would know that the rear wheels of artic trailers and of any trailer (horseboxes, caravans, etc) made a smaller circle than the front wheels. Then there is the body of the trailer to consider. Do they just not see such things when they are out driving? The artic driver will have been looking in front of him at other traffic crossing his path. The driving test should include compulsory watching of videos of such events. Near where I live last week a car in front of me almost came to a stop at green traffic lights because a car and caravan were turning left in front of it at the lights. The driver realised that the rear of the caravan would swing out to the right and into his lane and would have hit him had he continued. Top marks for seeing the potential accident and dealing with it correctly.